(0 Customer Reviews) | Write Review 8 issues per year An essential resource for teachers of 11-18 year olds across all subjects, Teach Secondary is as entertaining as it is informative, with sharp and relevant contributions from some of the most innovative and respected educational thinkers and practitioners around. Highlighting best practice; encouraging lively (and at times, controversial) debate; putting new products and resources to the test; and always listening to voices from the chalkface, it’s an inspiring celebration of all that’s genuinely outstanding in education today, especially the people. An essential resource for teachers of 11-18 year olds across all subjects, Teach Secondary is as entertaining as it is informative, with sharp and relevant contributions from some of the most innovative and respected educational thinkers and practitioners around. 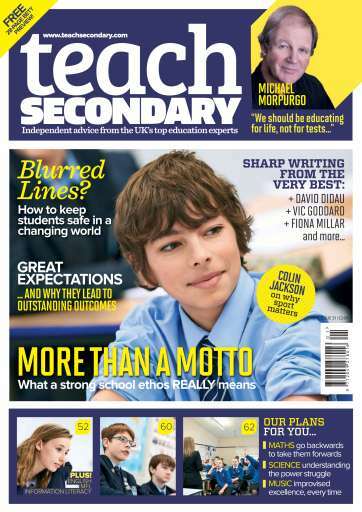 You'll receive 8 issues during a 1 year Teach Secondary magazine subscription. You'll receive 8 issues during a 1 year Teach Secondary magazine print subscription.